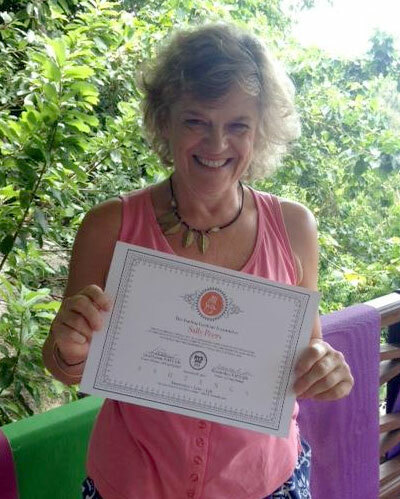 Congratulations to Sally Peers who came to SWYoga classes for many years before moving to Dubai – Sally has just returned to live in Ealing and qualified recently as a RYT 200 Yoga teacher – Sally I am very proud to have been involved on your Yoga journey! 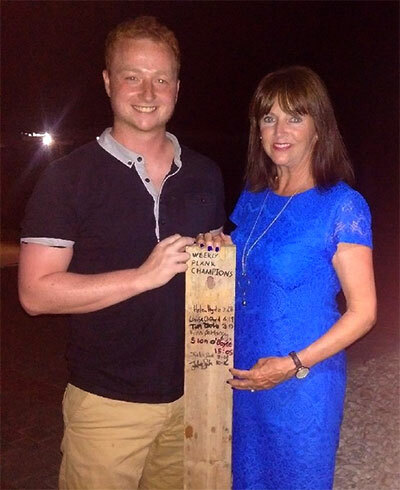 Many congratulations to Jules Smith who has been working hard on keeping up her fitness over the summer – in Vassilikki she managed to hold plank for a whopping 10 minutes and 16 seconds! 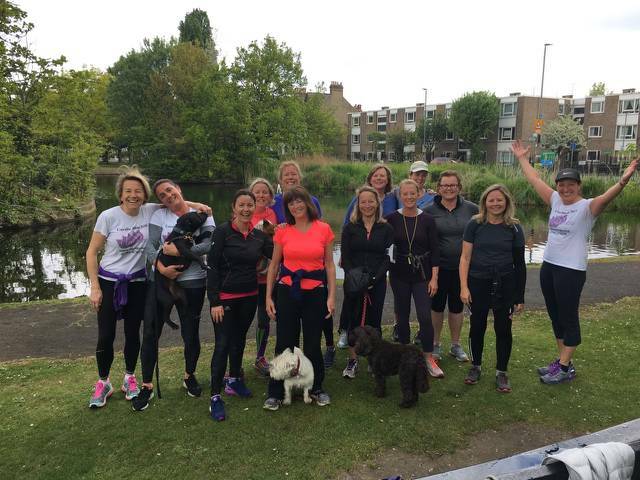 Watch out for a better time during the next Cardio-Blitz running from September 11th to 22nd and fantastic achievement Jules! Our latest Tri-annual Cardio-Blitz is currently half way through with everyone reporting feeling much fitter and more toned! We have added in 2 sessions in the Train Station Gym as part of the Blitz this time, we always try to make the sessions new and fun – and definitely not daunting! Join us for the next BIKINI BLITZ from June 26th – July 2nd to start your summer holidays bikini beautiful! 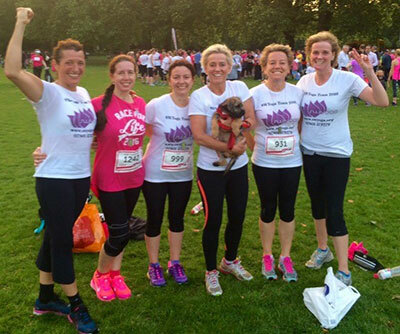 SWYoga team runs Battersea Park 5K Race for Life – Wednesday 8th June 2016! 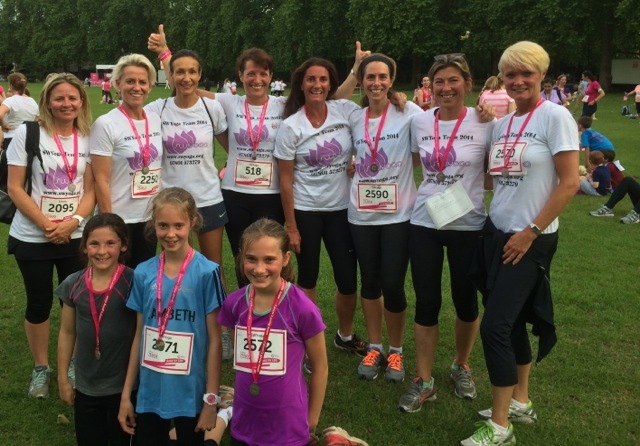 A small but select team of us took part this year and raised over £1000 for Cancer Research – great running and commitment girls and very well done! Congratulations to our plank princess from the last Cardio-Blitz in September 2015! Jules Smith managed to hold a 6 minute plank on the last day of the 10 days….respect! Her dog Harry was also so impressed he shook her hand too! 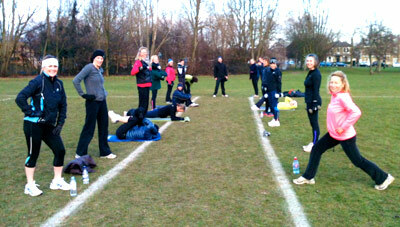 Our current Cardio-Blitz is midway through and its not too late to join! 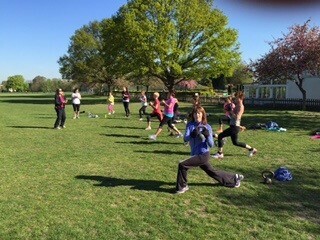 Beautiful weather this week and different classes each day – toning matwork indoors/kettlebells outside/cardio on Wandsworth common/Yoga….we are all feeling much fitter after 7 days! 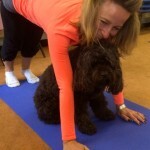 Wednesday and Friday Cardio-tone classes are for dogs and their owners! Our best behaved student is Florry pictured this morning with her hard working owner Kirstie! Well done to you both…. Details of SWYogas next retreats to Ibiza in October 2015 and Thailand in January 2016 will shortly be released – watch this space! 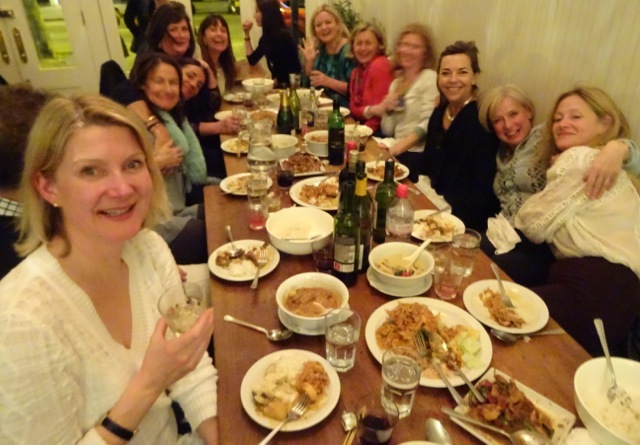 SWYoga had a reunion in Kaosarn restaurant Battersea on Thursday 4th March – lovely to see so many of you there! SWYoga is very proud of Cardio-tone class member Hilary Jones who has just completed the Bath 1/2 marathon in the wonderful time of 2hrs 4mins. This was her first competitive race and she credits her Wednesday and Friday classes as having got her race confident and ready! Very well done Hils! 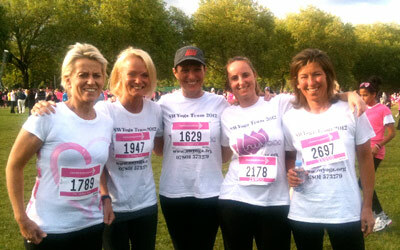 SWYogas fifth time to take part in Race for Life Battersea Park – well done to the team who steamed around (quite literally in the very warm evening!) and raised over £800 for Cancer research. As ever we retired to the Lost Angel Pub on Battersea Park Road to discuss! 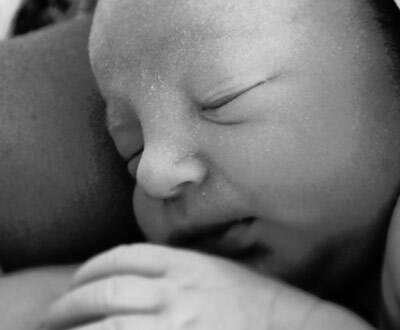 Many congratulations to Jane who has been attending all our cardio-tone classes up until this term and has just had a beautiful baby boy – we all send you love and look forward to seeing you post-natally! SWYoga were joined by over 20 determined ladies wanting to get fit fast and loose any pounds gained during the summer holidays – the weather was kind to us and the 12 days of the blitz flew past, well done to you all looking toned and fab on after our final workout! Our tri-annual Cardio Blitz courses are always hugely popular. 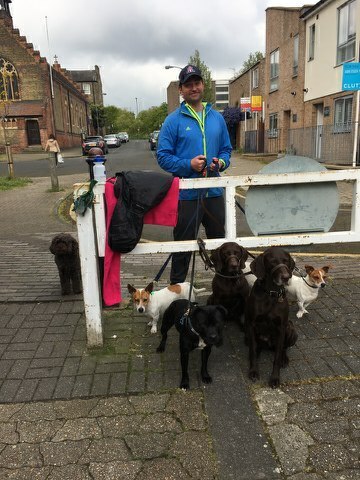 Lucy runs these alongside Sean Girlus and classes are run every day from 9am-10am for a two week period in January, May and September – key periods when the need to get back in shape fast are required! The class begins at Battersea Spiritualist Church on Bennerley Road, and weather permitting often incorporates Wandsworth Common. Lucy has devised a very effective diet plan to follow for those hoping to loose weight – we guarantee a minimum of 7lbs over the two weeks provided there is no cheating! Of course, the Blitz can also be followed simply to get fit again fast, and then progress to our Cardio-Yoga classes throughout the remainder of the term to maintain fitness. 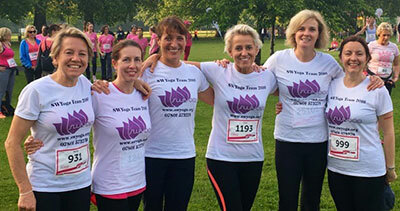 SWYoga enter this race each year with a team of runners – this year we all finished beating our times from last year and debriefing as always in the Fallen Angel pub on Battersea Park Road! We are proud to have raised over £850 towards Cancer research as a group, well beyond our target of £500.